John Jantsch: Stuff like payroll and benefits are hard. That’s why I switched to Gusto. And to help support the show, Gusto is offering our listeners an exclusive limited time deal. You sign up for their payroll service today, you’ll get three months free once you earn your first payroll. Just go to gusto.com/tape. Hello, and welcome to another episode of the Duct Tape Marketing podcast. This is John Jantsch, and my guest today is Andrew Warner. He is probably, most of you know him as the founder of Mixergy, a program that interviews experts to help you grow your business. I think I did a Master Class five years ago or so. John Jantsch: So you’ve been rocking and rolling for a while with this. You’ve also got a new initiative, something you call the Bot Academy. So welcome Andrew. Andrew Warner: Thanks. You know it’s so good to actually get to see you. I listen to your podcasts, and I know it’s all audio. But I’m glad that you’re doing video. I’ve got a screenshot here that I’m saving, just to remember how you’re doing this. John Jantsch: All right, cool. Well, you and I bumped into each other at a conference, gosh, a year ago or so, but it was like two ships passing in the night. I didn’t get to hear you. I don’t think I know if you were around when I spoke, but yeah it’s actually great. This isn’t in person, but this is closer, right? John Jantsch: So we’ve been hearing a lot about bots obviously. It’s probably the hottest topic right now. A lot of small business owners come to me and say, ‘Okay, is this new thing, something I need to pay attention to?’. So give me kind of the practical lowdown. Why should a small business owner, or really anyone pay attention to what maybe, seems like a fad, this bot thing? Andrew Warner: You know I wasn’t paying attention to it much for a long time, but what I did notice was that my email open rates were not increasing, and so I’m the kind of guy who wants to take action on stuff, so I hired a great copywriter, and she did fantastic work. I’m so proud of the work that she and I did together. The open rates increased a little bit, and the click rates increased a little bit, but it was not like revolutionary, and I want big. So I said all right. There is a company that will actually help increase your funnels. So I flew myself, my copywriter, we spent two days at the offices of this company, working through our funnel, the whole process from beginning to end. And I came back super proud, still I am of the work we did. And it increased the open rates a little bit, the click rates a little bit. And I thought there is something wrong with me maybe, because everyone else is you know helping me, and they are all experts. And then this company that I invested in, the founder sent me a research from MailChimp that said, here across the board, all of our open and click rates. I saw this amazing, and I went through and I realized, oh it’s super hard to get over 20% open rate. It’s super hard across industries to get over 3% click rates. That means 97%, 97 out of a 100 people are not clicking the emails that we’re sending out. It’s not just me, it’s across the board. And I realize, oh I am actually doing better than average. This is just the medium of email. It’s not getting much more open rates, it’s actually, I wouldn’t say dying, it’s just not growing. And I realize, oh look at how I communicate with my team, we use chat apps like Facebook Messenger, Skype, Slack, text to communicate with each other. My wife and I, we just told each other I love you before I got on with you, and I said I can’t talk for a little bit. But I did it by iMessage. We’re using iMessage and other chat apps to communicate with the people we work and love with, and no, when it comes to selling we use just email. And I thought there’s got to be something better. So I’m not using chat bots to anything kind of miraculous or 26th century. I am just saying if people are communicating via chat, how can my business reach in that way. John Jantsch: And that’s probably the theme that has come forward in the last year to this idea of meeting people where they are, personalizing, giving people better experiences. As you said, if that’s the experience they want to have, then we probably better pay attention. So before we go much farther, I suppose for some people we need to kind of give what you’re broad stroke view or definition is of a chat bot. Andrew Warner: Sure. You know what the best way for them to do it is to actually see what I’ve made in intro to one that they could see if they go to botacademy.com/ducttapemarketing. What if I should get ducktapemarketing? Do you get a lot of people say duck, like quack quack? John Jantsch: Well I do, and so of course I earn the URL for that. Andrew Warner: Okay, I’ve got to do botacademy.com/ducktapemarketing and ducttapemarketing. Because here’s what happens when they go there. They’re gonna see my face, hopefully I’ll even get a picture of you, and a button that says ‘hey, if you want to find out more, press this button’. They press the button, and then their phone will vibrate, and they’ll get an alert that says, ‘hey, do you mind if I use this to tell you about my work’. They tap that and they get the first tip where I show them how chat bots can help them. Then next they come back with the next message and the next message. So similar to email marketing, except you might notice one thing’s missing, there’s no form. If somebody comes to my site and subscribes to my email newsletter, they have to fill out a form. Tell me their name, tell me their email address. Lot of room for typos, lot of room for people to give fake names, or bad email addresses. Right, there’s none of that. They come to your site, they’re being offered something, they press a single button, and then they subscribe. John Jantsch: Yeah. And I think of course with the [ubicerousness 00:05:15] of Facebook Messenger, you know as a chat bot, I think that’s the other thing too. People are already subscribed, billions of people are already subscribed. Andrew Warner: 1.3 billion people on Facebook Messenger, not just once downloaded the app and ignored it every single month. And if they happen to be people who don’t have Messenger on their phone or don’t have new smartphones, next time they go to their desktop computer, they go to Facebook.com, my message will show in the bottom right. John Jantsch: And I’m certainly seeing the increasing numbers of people that are choosing that as a medium just to communicate with me. They wanna ask a question, they wanna recommend somebody. You know I am getting numerous Facebook messages. So I think as that behavior increases, then it’ll just be normal to be in there. Andrew Warner: And John, I’ll acknowledge this. Sometimes it’s frustrating, right? I might reach you via text message on a Saturday night, and then a friend of yours on Facebook Messenger, and then somebody else might really love telegram. I’ve got a friend who uses telegram with me. To be honest, it is a little frustrating that we have messages coming up, I saw everywhere. John Jantsch: Yeah. Like don’t forget Linkedin there. I mean every flight that we’re on, its sending us messages now. Andrew Warner: And so the issue is, that is the way of the future. The people do prefer chat, and the solution for that is coming in that our inbox used to be gmail.com or Outlook or our company inbox. What I am finding more and more is, iPhone is becoming, their messenger section is becoming that universal inbox and people are deciding what do I want in there, and what don’t I. With email I could email you. If I give your email address to a friend of mine, he could email you tomorrow with a request. If I give your Facebook Messenger URL to a friend of mine, he is never gonna bother you, no business can bother you there. I can’t message anyone unless they explicitly ask me to subscribe. So there’s frustration, but there is also a lot of user, end user controls there. John Jantsch: And I think this is true of email of course. We all just got burned up on getting emails. But again it all was, you know you were useful, you were helpful, you said stuff I wanted to read. I mean that’s how you got your emails opened, and I think its gonna be true of the bots too. Right if you just start spamming people even If they give you permission, you’re not gonna be working out. Andrew Warner: See you can’t. So here’s the beauty of this. John Jantsch: Well no. I don’t mean spamming in the same way, but if the stuff you keep sending, even if they’re giving permission, if not useful, they’re just going to say, ‘I don’t want you anymore’. Andrew Warner: You know John, I’ll say two things about that. How long have you been podcasting? Andrew Warner: Wow. So you even beat me to podcasting. I started in 2008. So you eventually build up a reputation, and what you find is, there are these PR people who start soliciting you. You get on their list. And most of them don’t look at your site, they just fire off the same thing to everyone. And there’s nothing blocking them from doing it. With Facebook Messenger, with chat apps in general, there is no way for me to message anyone unless they come to that page and hit the button. And ones they do, it’s all in the user’s control. They could always swipe up to delete me, swipe up to report me and then you know you’re gone. So I could see why many consumers, and many businesses are saying we prefer this to email. John Jantsch: Ya. So let’s talk about a couple of business use cases. You can think of, it doesn’t just have to be only to get clients. I think the best use of a lot of these technologies is to serve our existing clients. So think about if you want to share a couple of instance or use cases of how you are seeing some businesses do things. Andrew Warner: You know what, I will give an example of how a company that everything who has listened to this knows could use it to crystallize it. 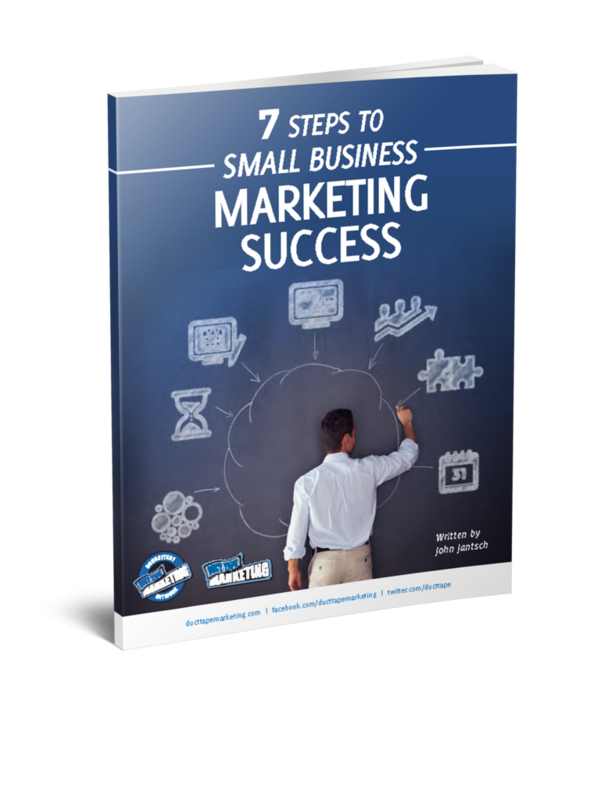 So anyone who could to Duct Tape Marketing for the first time will see in the bottom right, a little slide in that you’re using now that says, ‘grab the seven steps to marketing success guide’. They get to enter their email address, and then you send them the guide. Immediately you send them the guide and then you get to keep teaching them about marketing techniques that you’ve learnt that work for them, right. Well the same thing could happen with chat Bots, which you could do if say, if you want the seven steps to marketing success, press this button. No need to enter an email address, just press the button. As soon as they press the button, the chat pod says ‘here’s the guide I promised you’. And here’s the technique that’s working for our students. They also will then say, ‘can I email you this guide too, so you can save it for later?’. If they want it, all they have to do is to press again, one button. They don’t have to type in their email address because Facebook Messenger knows your email address. All they have to do is press a button and then it goes into their inbox. And now our students can reach people in two different ways – email and chat. So we’re finding people do that really really effectively. And again I incorporated that into the chat pod I created as a demo for your audience. John Jantsch: Well thank you. So now I also encounter a lot of companies when I buy something. They’re giving me an option if I want tracking, if I want to know when the order is gonna be ready. There’s all of this communication that we maybe used to send through email can come through chat as well. So as a customer service to us, I think its gonna be a huge adoption, isn’t it? Andrew Warner: So, I’ll give you a couple of basics, and then I’ll want to give one that’s mind blowing. A couple of basics are – yeah, you can send receipts through your Facebook Messenger, PayPal now will do that and Shopify stores will do that. Yes, you can do customer service. A lot of people are there on Facebook anyway, so they send a message to the business on Facebook. That’s basic, that can be handled. And in addition to having humans respond to it, you could also have a chat pod respond to some of the basic questions like, ‘what are your [00:10:37], what’s your refund policy’, an automated respond can do that. All right. Let me give you the mind blowing stuff John. I was on a site called Pure Cycles, looking at a bike. So I am a cyclist. I saw one. I added it to my shopping cart, and then my light took off to go to San Diego. I think you and I met each other at San Diego at drinks or something there. By the time I landed, I didn’t buy it, I just put it in my shopping cart and forgot about it, which we often do. When I landed, my phone vibrated and said, ‘hey, you forgot something’. I tapped the alert. It was a message via Facebook Messenger from Pure Cycles. A picture of the bike that I had put in my shopping cart and said, ‘do you want to complete your order of this? Do you want me to remind you about it later, or do you want me to never bother you with that again?’. That is something you can never do with email. I never entered my email address. All they did was put in an extra check box underneath the ‘add to cart’ button, and soon as I added to cart, that checkbox gave them permission to also follow up with me on Facebook Messenger. Super powerful stuff. We’re seeing, I think it is 1 out of 10 people buy when you use that. John Jantsch: That would have otherwise abandoned. Andrew Warner: 1 out of 10 people who put something in their shopping cart, and walk away, just abandon it, will come back and buy because of that. John Jantsch: Wouldn’t it be great if in your business, all you had to do was the stuff you love. The reason you started the businesses, it’s not all that administrative stuff like payroll and benefits. That stuff’s hard. Especially when you’re a small business. Now I’ve been delegating my payroll for years to one of those bug, corporate companies. Now it’s felt like little tiny fish. But now there is a much better way. I’ve switched over to Gusto, and it is making payroll and benefits and HR easy for the modern, small businesses. You know we have to be a big company to get great technology, great benefits and great service to take of your team. To help support the show, Gusto is offering our listeners, an exclusive limited time deal. If you sign up today, you’ll get three months free once you earn your first payroll. Just go to gusto.com/tape. So we all don’t pay much attention to email. I’m with you. It’s still an effective channel but is become less effective. Robots take that course, I mean again I am not saying it’ll be today or tomorrow, but Robots eventually take that course when everybody is doing it. Andrew Warner: I think the different is, the power is completely in the user’s hands. I’ve had people say to me, ‘Andrew, I have this huge group of over a 100,000 people on Facebook, can I add all of them to my Bot, and have my Botnet? No, you can’t. Can I have these customers? Can I add all?. No, you can’t. They have to explicitly ask to subscribe, and at any time they don’t even have to ask you to unsubscribe. The power of unsubscribe is in their hands. And the difference is, my assistant loves to use Expedia. Every time I want to book a flight, she uses Expedia. Problem with Expedia is, they immediately will subscribe me in every newsletter, and she must not look at all the check boxes that are there. And so I get a ton of email from them. I always will go through and personally unsubscribe, hit that button and unsubscribe. And often what I get from them is, it’ll take up to 10 days to unsubscribe. I think, what are you guys doing up to 10 days? Are you taking a punch card and putting it into a computer? Do you have to, what is this? And so, the difference here is it’s in their hands, the unsubscribe process is their way. How many times have you hit a link to unsubscribe, and you think you unsubscribe, then you look at one of the tabs that was open in the background on your computer, and you realize it says ‘to complete the unsubscribe, enter the email address you signed up with’, and go ‘I forgot. I don’t even know the email address we have on file. And it doesn’t happen with chat. Andrew Warner: But I wouldn’t tell people John to give up on email. We even created code, we give to our students that allows them to say, ‘Look, you have a client who uses email and they love it. Just add this little bit of code, and then give permission to get chat messages to the user and email. It doesn’t have to be an either or, it could be an and. John Jantsch: Yeah. What I think is it’s like a lot of things. Actually I suspect and maybe I’ll ask you this as a question. I suspect there are people that are actually building their email list more effectively using chat Bots, just to describe. And making the channel itself a better channel again because they’re using it in smarter ways. Andrew Warner: Yes. And I’ll make sure that the chapter I create as a demo here will have that. Because what you’re gonna see is, you don’t have to type in your email address. One of the problems with typing in on a phone is, tons of typos. Well-intentioned people like me, I always for some reason, I wonder if this is you or other people do too, I don’t type in ‘.com’ for Dotcom, I type in ‘.ckm’. I don’t know why. I guess the K and the O are close, but so is the L and the O.
John Jantsch: So I give you a tip. You know in your iPhone you can create shortcuts. Andrew Warner: I never type my email address. It’s email. Yeah. Oh yeah. Mine is like depending on the email address. Yeah. And still for some reason I have to type it in. I wonder why I do that. John Jantsch: I don’t know. Sometimes they don’t work. Sometimes the fields in the form don’t work. So I want to ask you two things about this technology that I think a lot of people run into. A lot of people are using AI, if it is really that. In some of these Bots, where there are kind of pre-programmed things, and we’ve all experienced, I’ve experienced a couple of really good ones, I’ve experienced some that just become like a circle of hell. You know it’s like that, whatever I ask, I might get a stupid answer, and then they say, ‘great, are you happy now?’. No, I’m not happy. It didn’t give my question an answer. So you know is that just laziness? Is that bad technology? And I mean, is that gonna get better? Andrew Warner: I see that it will. I invested in a company that’s working on that, and doing a phenomenal job. It’s called Assist. They work with companies like 800 Flowers. The stuff is going to get better. It’s just not there yet. And so I would say to anyone who is listening to you, you know what, don’t do it yet. Don’t try to have your Bot be super smart. Just think of it as another way of reaching people. They prefer to get messages on chat instead of email. And I’ve got stats that show it, and reach in a chat instead of email, and let the intelligence get added in as it earns the right to get added into the experience. I’ve seen some of these futuristic things. They are amazing, where you can actually say to a chat pod, ‘my wife is having a birthday next week’. The chat pod will say what is your wife like, ask you general questions about her, and then suggest Grey flowers. We’re not exactly there yet. In a world where that Bot will not break. But it’s coming. John Jantsch: So let me ask you, one hard question before you can tell me about the Bot Academy a little more. A lot of people realize that Facebook paused the chat bot feature for a period of time, and I think that that kind of gave some other people reason to pause. Do you want to talk about why that was, what the impact to that is, should we be nervous about that? Andrew Warner: I actually was happy that they paused, allowing new people to create chat bods. What I saw was people getting away with so much. This is a really powerful medium. Anything I send out is going to get, just about over 40% open rates pretty easily. So what I saw was people were creating these deal bots, where they were getting someone to subscribe, and then they were sending out nothing but marketing messages under the guise of deals. And it clearly goes against Facebook’s Terms of Service. They don’t want to pollute the environment by creating nothing but spam, and people didn’t got away. And I was sitting on the sidelines go, ‘Am I a sucker for not doing that?’. Andrew Warner: And then Facebook shut it down and said ‘let’s look into it’. There was a therapist bot, which said, ‘no human being could ever see what you’re saying to the therapist bot’. And I wrote to the founder. I said, ‘are you out of your mind? Of course a human being can. Stop saying that’. And so Facebook started cracking down on this stuff. So having said that, I think that they were right to do it. But I will also completely acknowledge this platform risk. If you have nothing but Facebook as your way of connecting with people, there’s a big risk. Which is why you’ll see my bot, one of the first things it asks is, ‘what’s your email address?’. In the near future, we’ll be able to create the same type of chat pod, and we already do, on different platforms on your website, that has nothing to do with Facebook. I saw bots on Alexa. I don’t think they’re there yet, but we’re going to see it be superstrong. I think in business you’re gonna see it go to slack. I’ve seen some on LinkedIn. I think we’re going to start to see it on lots of other platforms. We should diversify. But you got to start somewhere, and this is 1.3 billion people who are checking it every month. I’ve got to be where they are. John Jantsch: Probably the most advanced platform with those point. Andrew Warner: So I’m talking a lot here John, right. I’m like hub hub hub hub hub. There’s so much I want to cover. John Jantsch: No, no. It’s awesome. Andrew Warner: I know your podcast will show for like 2-3 hours marathon. John Jantsch: We’re gonna run out of time, so we better queue up what the Bot Academy is? Why you started it? Why people are to check it out? Andrew Warner: The reason I started is, I am an angel investor. I made an angel investment in a couple of chat pod companies, and I wanted the founders, I said to them ‘look here’s where I think chat pod’s going’. In the future it’ll be as intelligent as you’re showing me, in the present give us a way of connecting with our customers’. And then I said ‘let me show you’, and I created a bot, and then I started teaching people how to do and I said ‘look it’s working’, and they said ‘you know what, it does make sense, this does work’. And what it is, is a place for me to teach people how to create chat bots, and if they want to, I know that there are a lot of businesses who come to me and say, ‘can we hire you to do it?’. In the past I would do just to learn about this industry that I was investing in. Now I say, ‘guess what, we have these graduates. If you want a chat pod built, one of our graduates can do it for you’. So anyone who wants to learn how to build a chat bot, and do it the way that I just described can go to botacademy.com/ducttapemarketing. And they’ll see the one that I created for this, for us, for our little group, and you’ll get to experience it. And I think that this is something that we’re gonna start to see more and more of. And I don’t want to miss it. I didn’t miss email when it started. I don’t wanna miss this. John Jantsch: Well, so listeners of course first of all will have the links shown as we always do. But I would also tell people, you know if anytime a new topic comes up, you’ve already seen it. Get rich with bots and all the courses are coming, the people are putting out there. And so if you’re going to learn about a new topic, I highly encourage you to learn from somebody you can trust, and are particularly in that category. So it’s a topic you should learn about. Doesn’t necessarily mean, you need to sell your house and get involved in chat bots for the rest of your life. But it’s an important topic, and you know like all things, even if you’re going to hire somebody to build something, you better know why and how and how to be an informed buyer. So Andrew, thanks so much. Great catching up, even briefly. And hopefully we’ll see you out there soon. Andrew Warner: Thanks, a longtime fan. Thanks so much for having me on.